Costa Rica continues to advance in designing public policies favoring equality between women and men and in the eradication of violence against women. Undoubtedly the woman’s rights movement merits the greatest credit for these advances. The work that the Costa Rican MenEngage Network and Instituto WEM have done, promoting positive masculinities in young and adult men, brings its bit to these successes, especially by involving men in these social changes. The Instituto WEM is the coordinator of the Costa Rican MenEngage Network (RMECR) and the focal point for the White Ribbon, Paternal Leave and Men’s Health campaigns. IWEM offers personal growth groups for adult men and adolescents, as well as public education called “Men’s School”, which examines with men themes from their everyday lives. In addition, we have positioned the masculinities component into the national public agenda and in dialogues with feminist and governmental institutions whose mission is gender equity and work with women, in this case the National Women's Institute - INAMU. Men’s Health Act passed in 2013. This law encompasses a broad concept of men’s health, including aspects having to do with changes in lifestyle characteristics of hegemonic masculinity and promotion of emotional ties that foster peaceful coexistence. The same act proposes the formulation of a National Men’s Health Policy and regulation. At this time, the final version of the regulation is being completed for submission for national review. National Policy for the Promotion of Positive Masculinity and the prevention of Men’s Violence towards Women, currently being produced. The state, through the INAMU, has entrusted Instituto WEM to develop this policy, which will be part of the National System for Attention to and Prevention of Violence against Women and Domestic Violence in Costa Rica (PALNOVI). The formulation of this policy has involved IWEM and RMECR in an intense process of dialogue, consultation and reflection with Costa Rican institutions, feminist and other sectors. The “Primary Prevention of Violence at the Local Community Level” Program, sponsored by the National Institute for Women, is a program in which non-governmental organizations working with distinct populations and issues participate with IWEM, and from which it aims to build a model of community work. The MACHIS-NO Program and Campaign. This program aims to prevent violence in the context of soccer, supported by the state and involving all the first-division Costa Rican soccer clubs, from major to minor leagues. IWEM is commissioned to design and implement the training, which will take place within the 12 stadiums of the first division (for football captains, coaches, administrative personnel and players from all clubs). This campaign will culminate in the adoption of a code of ethics by the football players, the basis of which will be the Global MenEngage Code of Ethics. It should be added that the innovation in this entire advocacy experience resulted from the recognition of research, publications, recommendations and calls to action that MenEngage Alliance and its Latin American network promoted through the Global Symposia (Brazil, 2009; New Delhi, 2014) and International Symposia on Men and Masculinity. And, the contribution of the three international campaigns (White Ribbon, Men Care Parental Leave and Men’s Sexual and Reproductive Health), as well as the MenEngage Code of Conduct, are the basis for documents being developed to support these policies and programs. This advocacy work has been very important to show that there exists some lack of trust towards the work that men’s organization can carry out in the name of equity/equality and the eradication/prevention of violence against women. 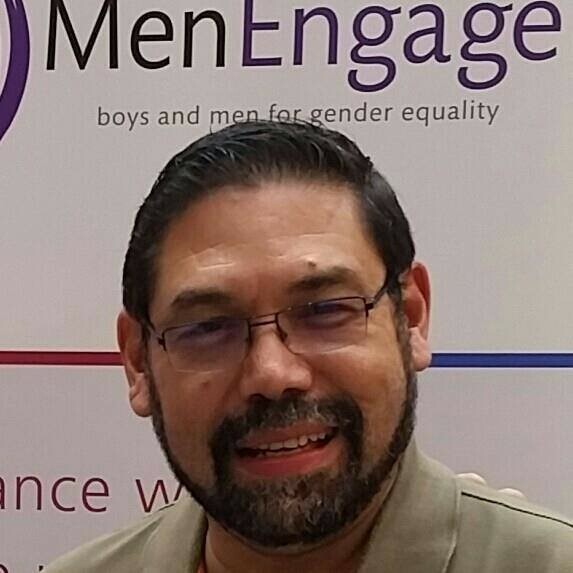 MenEngage is not only an alliance of organizations; it is also an ideological and ethical framework to guide us toward and from which to work with men. The harmony and solidarity with feminism and human rights, as well as calls to action during the international meetings promoted by MenEngage, have made some Costa Rican government civil society sectors and the women's movement see work with men more reliably and visualize men as allies of equity and in the culture of peace. Advocacy in support of a masculinities component should be done in partnership or dialogue with feminism and the women’s movement. In fact, from an ideological point of view, work with masculinities and men has as its goal the dismantling of the system and patriarchal order, with its corresponding sexist, adult-centered, discriminatory and homophobic order. Overcoming gender inequities and injustices is the objective of the work. “Work with men and boys comes from and honors the pioneering work and ongoing leadership of the women's movement and feminist. (…) Working in close synergy with women’s rights organizations, we seek to change attitudes and practices of individual men, and to transform the imbalance of power between men and women in relationships, families, communities, institutions and nations." Recognition that masculinity studies and work with men has emerged and developed through its link to the process of struggle for equality provided by women's movements and feminism. Research on masculinity and work with men should be the initiative and primary responsibility of men, without excluding the contribution of women who are interested in this topic. Groups or movements of men who should be supported or promoted are those who seek change towards gender equality and not those who seek to maintain or reproduce patriarchal oppression. Those who work on masculinity and men should maintain an open and respectful dialogue with those working on femininity and with women. This work should be guided by what Marcela Lagarde proposes as an ethic based on solidarity and cooperation, equal opportunities, equitable distribution of goods and positive powers, processes of individualization and community approach, as well as social and political participation as a way to ensure political democracy and a regime of respected rights. " For IWEM, building public policies that encourage new masculinities is framed as a political project, and at the same time as a humanist project in search of meaning, in the construction of the "new man". Osho (2014) suggests that it is not about being a better man; it is about being a new man. We cannot build public policy without this dimension of utopia. And so, it is enshrined in a revolutionary project of a society without patriarchy. Costa Rica sigue avanzando en el diseño de políticas públicas favorecedoras de la igualdad entre mujeres y hombres y de la erradicación de la violencia contra las mujeres. Sin duda, el movimiento por los derechos de las mujeres merece el mayor crédito por estos avances. El trabajo que hemos hecho desde la Red MenEngage Costa Rica y el Instituto WEM, promoviendo masculinidades positivas en los hombres jóvenes y adultos, aporta su grano de arena a estos logros, sobre todo en cuanto a involucrar a los hombres en estos cambios sociales. El Instituto WEM es el punto focal y coordinador de la Red Men Engage en Costa Rica (RMECR) y el punto focal de las campañas Lazo Blanco, Paternidades y Salud Masculina. WEM ofrece grupos de crecimiento personal para hombres adultos y adolescentes, así como una oferta de Educación popular llamada “Escuela para hombres”, en la cual se revisan con los hombres temáticas de su vida cotidiana. Hemos además posicionado el componente masculinidades en la agenda pública nacional y en diálogos con el feminismo y las instituciones gubernamentales que tienen como misión la equidad de género y el trabajo con las mujeres, en este caso el Instituto Nacional de las Mujeres – INAMU-. Ley de Salud Masculina, aprobada en el 2013. Esta ley propone un concepto amplio de salud masculina, ya que se incluyen aspectos que tienen que ver con cambios en los estilos de vida propios de la masculinidad hegemónica y de promoción de vínculos afectivos que propicien una convivencia pacífica. La misma ley propone la formulación de una Política Nacional de Salud Masculina y un reglamento. En estos momentos se está concluyendo la versión del reglamento para someter a consulta nacional. Política Nacional para el Fomento de Masculinidades Positivas y prevención de la violencia masculina hacia las mujeres, en proceso de producción. El estado, a través del INAMU, encarga al Instituto WEM la elaboración de dicha política que será parte del Sistema Nacional para la Atención y Prevención de la Violencia contra las Mujeres y Violencia Intrafamiliar de Costa Rica (PLANOVI). La formulación de esta política ha implicado para el IWEM y la RMECR un proceso intenso de dialogo, consulta, reflexión, con la institucionalidad costarricense, el feminismo y sectores diversos de la realidad nacional. El Programa “Prevención Primaria de la Violencia en el nivel local comunitario”, auspiciado por el Instituto Nacional de las Mujeres, es un programa en el que participan otras organizaciones no gubernamentales que trabajan con otras poblaciones y temas, junto con el IWEM, programa desde el cual se pretende construir un modelo de trabajo comunitario. El Programa y Campaña “MACHIS-NO”. Este programa busca prevenir la violencia en el contexto del futbol, apoyado desde el estado e involucrando a todos los clubes de la primera división de futbol costarricense, desde ligas mayores hasta ligas menores. Le encargan al IWEM el diseño y ejecución de la capacitación que se va a desarrollar en los 12 estadios de la primera división (los capitanes de futbol, directores técnicos, personal administrativo y jugadores de todos los clubes). Esta campaña culmina con la adopción de un código de ética por parte de los jugadores de fútbol, cuya base será el Código de Ética de Men Engage Global. Cabe agregar que lo innovador de toda esta experiencia de incidencia política es que se ha hecho un reconocimiento de las investigaciones, publicaciones, recomendaciones y llamados a la acción que la Red MenEngage Global y Latinoamericana ha promovido a través de los Simposios Globales (Brasil, 2009; New Delhi, 2014) y los Coloquios Internacionales sobre Varones y Masculinidades. Y el aporte de las tres campañas internacionales (Lazo Blanco, Paternidades –Men Care y Salud Sexual reproductiva, al igual que el Código de Conducta de Men Engage son la base para los documentos que se están elaborando para sustentar dichas políticas y programas. Este trabajo de incidencia política ha sido muy importante para evidenciar que existe aún desconfianza hacia el trabajo que pueden llevar a cabo las organizaciones de hombres por la equidad/igualdad y por la erradicación/prevención de la violencia machista. MenEngage no es solamente una alianza de organizaciones, es también un referente ideológico y ético que guía hacia dónde y desde dónde se debe trabajar con los hombres. La sintonía y solidaridad con el feminismo y los derechos humanos, así como los llamados a la acción de los Encuentros Internacionales promovidos por MenEngage han hecho en Costa Rica algunos sectores gubernamentales, de la sociedad civil y del movimiento de mujeres miren de manera más confiable al trabajo con los hombres y visualicen a los hombres como aliados de la equidad y la cultura de paz. Las acciones de incidencia política en favor del componente masculinidades deben hacerse en alianza o en diálogo con el feminismo y el movimiento de mujeres. De hecho, desde el punto de vista ideológico, el trabajo con las masculinidades y con los hombres que se desea impulsar es aquel que tiene como utopía política la desarticulación del sistema y orden patriarcal, con su correspondiente orden de género sexista, adultocéntrico, discriminatorio y homofóbico. La superación de las inequidades e injusticias de género es el norte del trabajo. “El trabajo con hombres y niños proviene y honra el trabajo pionero y el liderazgo continuo de los movimientos de mujeres y feministas. (…). Trabajando en estrecha sinergia con las organizaciones de derechos de las mujeres buscamos cambiar las actitudes y prácticas de hombres individuales, y transformar el desequilibrio de poder entre hombres y mujeres en las relaciones, familias, comunidades, instituciones y naciones”. El trabajo con hombres debe respetar, apoyar y fortalecer los derechos de las mujeres, y acatar los compromisos Internacionales de Naciones Unidades. Estos compromisos instan a tomar acciones para involucrar a hombres y niños en el logro de la equidad de género. La alianza con el feminismo requiere tiempo, diálogo, flexibilidad, negociación. Como lo plantea la feminista Escalante (2002), “Para lograr la equidad, para cambiar las relaciones de poder entre los sexos, hay que incluir discusión sobre los hombres y la masculinidad. El problema son los roles tradicionales, no los hombres.”. Y la autora concluye de la siguiente manera. Partir del reconocimiento de que los estudios sobre la masculinidad y el trabajo con los hombres ha surgido y se ha desarrollado vinculado al proceso de lucha por la igualdad que han dado los movimientos de mujeres y feministas. La investigación sobre la masculinidad y el trabajo con hombres debe ser iniciativa y responsabilidad principal de los hombres, sin excluir el aporte de las mujeres que tengan interés en este tema. Los grupos o movimientos de hombres que se deben apoyar o promover son aquellos que buscan el cambio hacia la equidad de género y no los que buscan mantener o reproducir la opresión patriarcal. Quienes trabajan sobre la masculinidad y con los hombres debe mantener un diálogo abierto y respetuoso con quienes trabajan sobre la feminidad y con las mujeres. Construir políticas públicas que fomenten nuevas masculinidades se enmarca, para el IWEM, en un proyecto político y a la vez en un proyecto humanista de búsqueda de sentido, en la construcción del “hombre nuevo”. Osho (2014) plantea que no se trata de un hombre mejorado, se trata de un hombre nuevo. No podemos construir políticas públicas sin esta dimensión de la utopía. Así se engarza en un proyecto revolucionario, de una sociedad sin patriarcado.